Slow way – standard application via box office waiting list. (up to 10 years). First-time applicants must (1) email Bayreuth box office to request a ticket order form in the snail mail; put your name, address and phone number; (2) receive your ticket order form in 3-4 weeks; (3) carefully peruse the ordering instructions, note the online order URL, login info and the start date of order processing; (4) submit your ticket request on the exact date (For 2017 tickets, order starts on 10/15/2016) either Online or via postal mail; (5) successful orders will receive an invoice confirmation by Jan 15, no news means no luck this year. You will not get confirmation for an unsuccessful order. A limited number of single tickets (for non-Ring operas only) may be made available on Feb 12. For existing ticket applicants on the waiting list, you should receive a new order form by postal mail in late September/early October, follow the same instructions #3-5 above. Fly from U.S cities to Nurmberg (1 or 2 stops), then take the 1-hour train, taxi or drive to Bayreuth. A few hotels in the outskirts run a bus to the Festspielhaus. Staying in town is recommended to avoid the hassle of Germany’s overcrowded and unreliable trains or parking your car. For hostels and B&B’s contact the Bayreuth Tourist Office. Book your room at the same time you receive the order confirmation, either directly or through the Box Office. Beware that most hotel rooms are not air-conditioned. 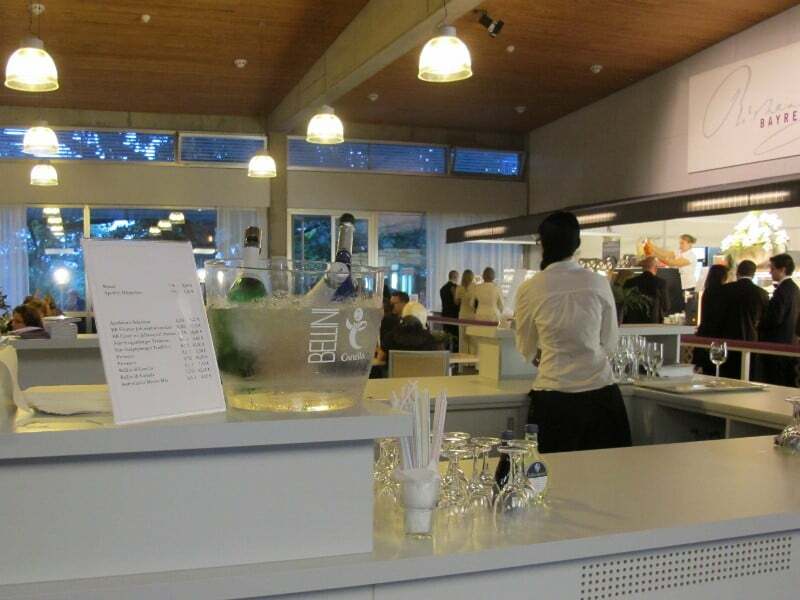 In-house dining – (1) the formal dining needs to be booked in advance, (2) self-service cafeteria a popular bratwurst stand and several bars, (3) outside food carts. The common food theme is limited variety and lots of pork items. If you choose to eat afterward, beware that post-performance taxi and hotel bus lines can get crazy. There is a McDonalds at the train station if you cannot stomach another bratwurst or pork schnitzel. My recommendation is snack a lot during the day and in between acts, and pig out afterward. German meals are heavy and you don't want to be in a food coma during the performance! Dress code – black tie/evening dress formal, but 50% of people wear simply ‘business casual’. Look what the people wear here (notice the three people in jeans in photo #2). High heels not recommended due to cobblestoned ground. Make allowance for tropical heat, night chill and possible rain. As of the date of this writing, the Festspielhaus is not air conditioned and the doors are closed during a performance. Get to the Festspielhaus one hour before curtain. Curtain time is 4pm (or 6pm for “Das Rheingold”), with one hour intermission between acts. You can rent seat cushions and binoculars from the theater. Bring lots of cash in small bills for programs, snacks, drinks, cafeteria and gift shops. There is not a lot to do in Bayreuth outside of the Wagnerian happenings. Do check out the Richard Wagner Museum, the Margravial Opera House and the Hermitage if they’re open (check with the Tourist Office). Click here for other local attractions. You can hike up and down the hill from the Festspielhaus for exercise, or do the ‘beer trail’ in nearby village Aufsess. Take a day trip to Bamberg, Warzburg, or Nuremberg.